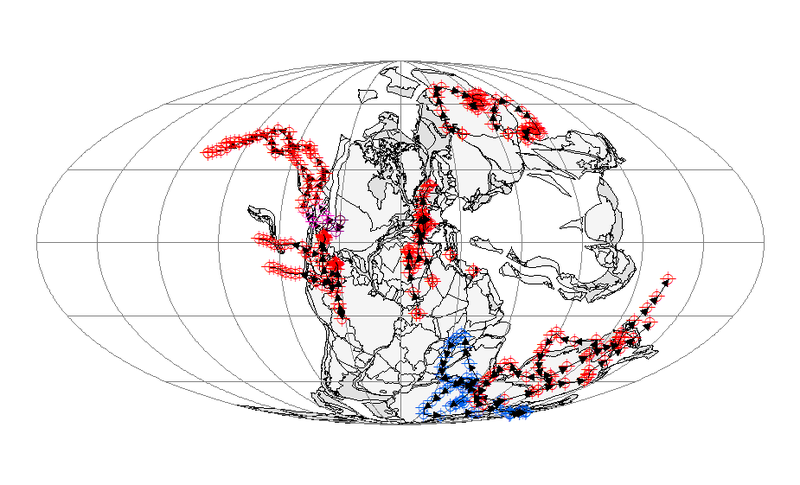 In the first post of this series we explored the rationale for extending precise analysis of continental motion only 250 million years. The ultimate goal of this exercise is to develop rigorous constraints on the forces creating the different motions, but first we will finish the descriptions. Pangea was like a pile of flotsam. It was buffeted from various directions, and rather than responding as a unit, different units moved differently as the pile evolved and eventually broke up. Of the six continents we are working with, Africa and South America were keyed together for a while, North America and Eurasia were always dancing to different drummers than the rest, and Antarctica and Australia stayed together for a long time. 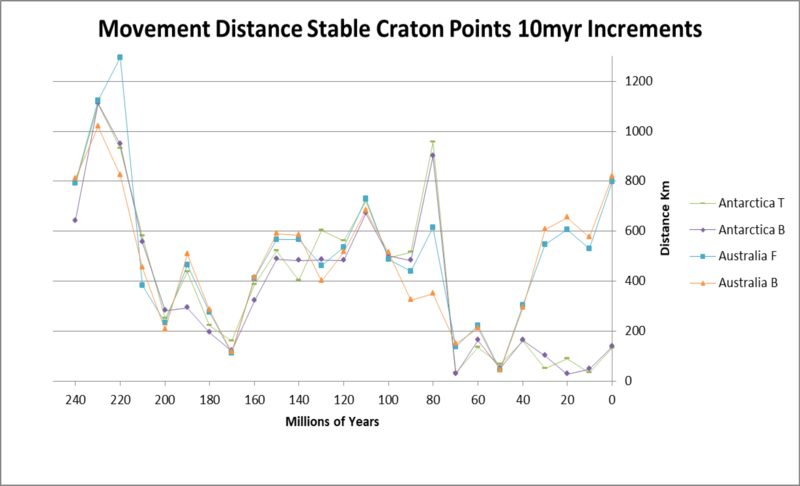 It is interesting to view above the motions from the starting point 250mya. Antarctica and Australia can be better seen from a polar view above. Since the paths cross, we turned Antarctica blue for clarity. It can be seen that the two were very closely bonded for 150 million years. Between 110 and 100mya, their wander paths very nearly completed a circuit. The Australia point at the mouth of the Roper River and the Bay of Carpentaria passed within 17 kilometers of its starting point 150 million years earlier. 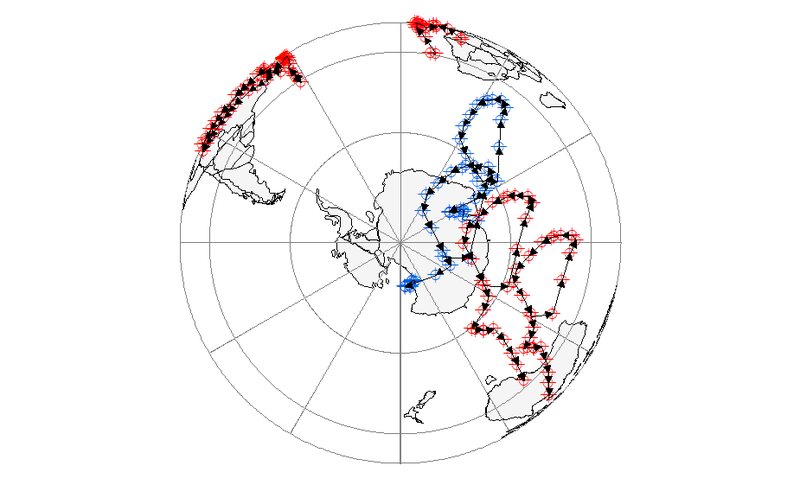 After the separation, Antarctica moved west to straddle the South Pole, and Australia arced mostly north. Since the points are stable, differences between pairs of points result from rotation centered closer to one point than the other. 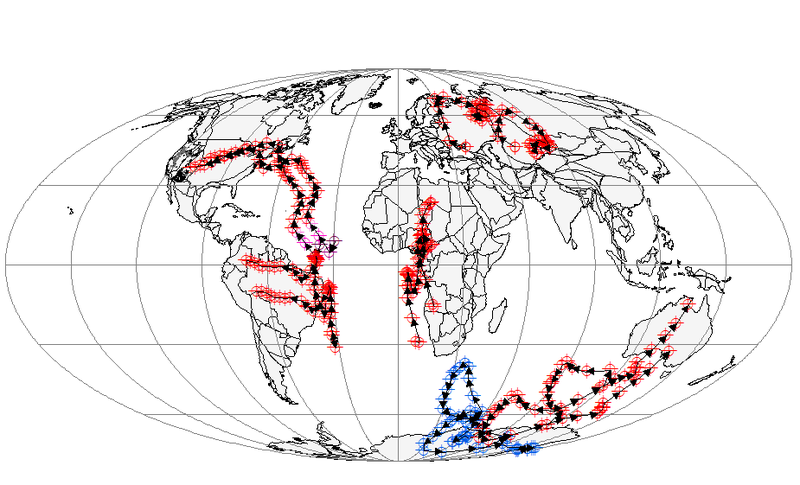 It is worth noting that at 200mya, the points corresponding to current east Antarctica and north Australia were rotated to positions at 37 degrees latitude, the current positions of San Francisco and Melbourne, Australia. This should be borne in mind when marveling at “alligators and palm trees” in Antarctica. It is also notable that the 200mya northern apex of the circuit and the reversal correspond to one of the great extinction events in earth history. The circular gambit of this pair of continents before their separation seems bizarre, but we will see that Eurasia has a spiral track when we examine the remaining two individualistic continents in the next post.